The Hoover WindTunnel T-Series Upright vacuum seems to have everything you could need or want in a vacuum. The rinse able filter is a nice money saving feature, and the indicator light tells you when it is time to clean or at least check the filter. The vacuum itself is modern looking and the fold down handle makes this vacuum easy to store. Overall, the majority of customers liked the Hoover WindTunnel T-Series plus and would recommend it to those looking for a mid-priced vacuum. Oreck began making vacuum cleaners in 1963 and has become known for offering commercial grade lightweight vacuums that perform well. The new Oreck Magnesium vacuum continues this tradition with the lightest Oreck yet. Ultra-Lightweight at 7.7 pounds – lightest Oreck ever! This thing looks awesome, seems like the best lightweight vacuum you can get. The blue and magnesium looks sharp as well. Excellent cleaning on hard surface floors like hardwood floors. Maintenance can be pricy as you have to use Oreck service centers. No attachments – need a separate hand vac or canister to do the things attachments usually do. A few customers did not have as much luck with suction power as most did. 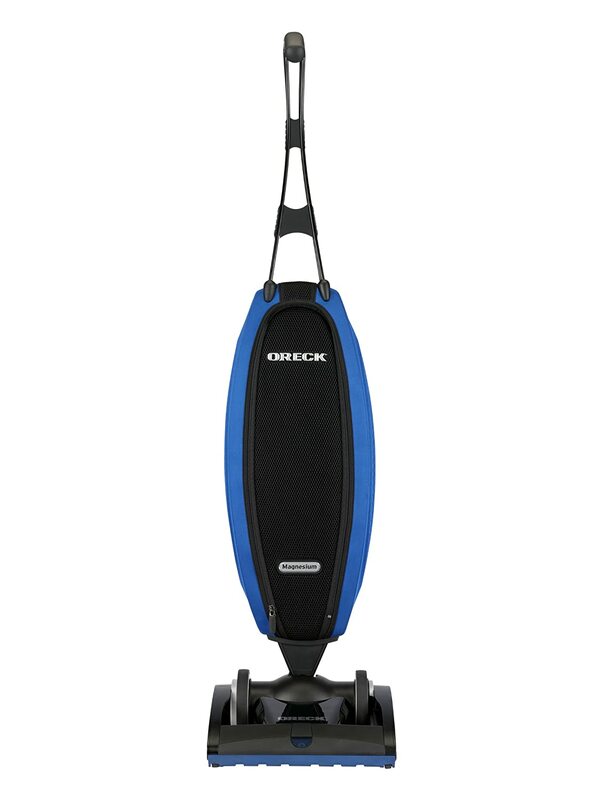 Overall, the Oreck LW100 Magnesium Vacuum is highly recommended for those looking for a lightweight vacuum that can handle thick carpet. To be honest, while the vacuum looks modern and attractive, it pretty much looks like most canister vacuums on the market today. What can you expect, it is a vacuum, and despite it’s hefty price tag, it is going to look like a vacuum. It’s the performance that really counts, and for that, it’s the user reviews that really count. Overall, after reading the reviews across the internet, it is clear that most people find this a well functioning vacuum. However, those who felt that the amount this vacuum sells for is over the top, were disappointed in this vacuum, because they somehow expected it to do more. The dissatisfaction in these cases really isn’t so much about how this vacuum functions as it was with the guilt that buyers felt over spending more for a vacuum than they could afford. Anyone who has ever had the small wheels of a regular vacuum seize up, due to picking up threads in the sewing room or long animal hair that sometimes gets wound around the wheels, will be thrilled with the ball technology on this vacuum. You will also love the way that this vacuum seems to glide across the floor rather than feeling like you a pushing a hand plough though an uncultivated field. Some of the customers did find that this vacuum was not as good as they expected it to be on picking up animal hair, and they felt the attachments could be better made. Overall, the Dyson DC39 vacuum seems to work exceptionally well on high pile carpeting and smooth floors. While this vacuum isn’t perfect, the majority of customers really like this vacuum and would recommend it. Considering the 4 vacuums included in this review, it is nice to know that there is a vacuum for high pile carpet that comes in a variety of price ranges, making one of these vacuums affordable to everyone, no matter what their budget. Now that you have seen some of the best vacuums for high pile carpet, and had a chance to read the detailed reviews on 3 of the top vacuums for high pile carpet, it’s up to you to pick the vacuum that best suits your needs, is in your price range, and suits your home. The above comparison table will be updated to reflect any changes in the vacuums offered. If you feel we might have missed a superior vacuum for high pile carpet that you think should be included, please let me know in the comments below.